Do you want to get more traffic or visitors on your website to red your blog posts? Here in this post I am going to tell you about a push notifications service that will help to increase your website or blog traffic or more properly it will increase the regular visitors of your site. Pushengane is a push notifications provider for browsers that you can enable the push notifications system on your website. It will work for Chrome and Firefox. Safari Support is also coming soon. This push notification system will work for both desktop and mobile. Yes it is free with a limitation. The free plan will allow you upto 2500 active subscribers and if you need to pay in a monthly basis if you want more. The premium version starts with $29 per month. For a new site with small traffic the free plan is enough. So how to enable it on your website or blog? It is very simple to enable it on your website or blog. First you just need to register for free on Pushengage and after complete registration you need to login and you will be sent to the dashboard panel. Now click on “Setting” on left side and choose installation settings. From here you can upload image which will be shown when someone receive push notification. You will find Core JS Code which you have to copy and paste inside the source code of your website. If you have HTTPS enable than download and install the package files on your website. Thats all. 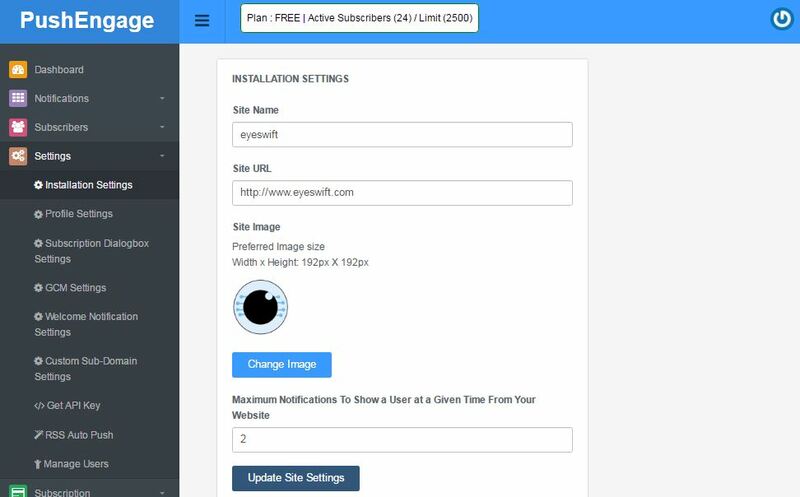 Now your push notifications system is ready for your website/blog. You can also install and activate the PushEngage Browser Push Notifications Plugin for your website. This is really easy. Just open “Notifications” and then click on “New Notification”. Now fill the form by entering your notification title, notification message and URL. Then submit it and your push notification will be sent. Using this push notifications can highly improve your traffic and regular visitors for your website. 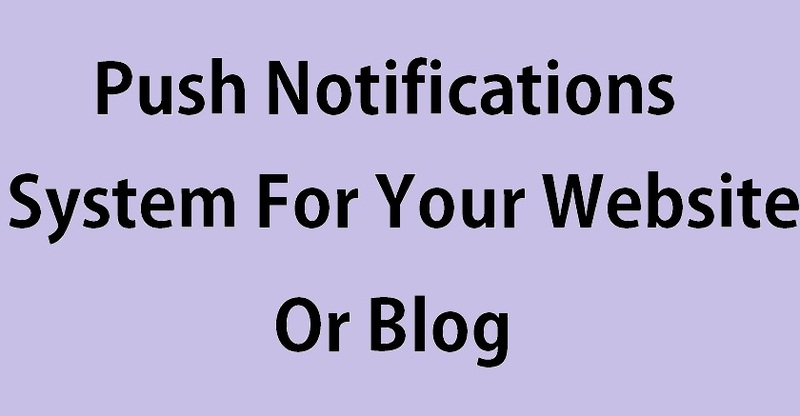 So it is really great to use this push notifications service for your website or blog. Well this service is available both for HTTPS and non HTTPS websites. But I have only used it for HTTPS website and the website is where you are right now. Yes, its EyeSwift. If you are using newer version of Chrome or Firefox than you have already see that our website asking you for allowing the browser’s push notifications. Yes, that service is provided by Pushengage. So you see that Pushengage is really a great service. Whenever you write and publish a new post, you can send a push notification with the link of the new post. Now lets try it on your site. « Why And How Improving In Alexa Rank Is More Profitable? Why Web Push Notifications Are Better Than Email Newsletter?